Today we welcome Phil Hill, executive vice president at Delta Initiative, as a guest blogger. 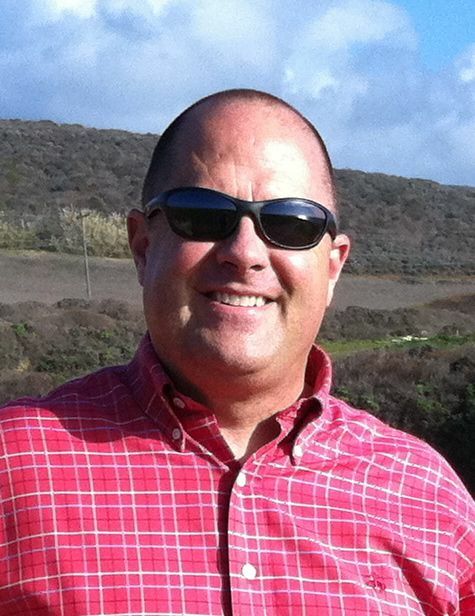 Phil is a consultant and industry analyst covering the educational technology market primarily for higher education. We have seen a great deal of change in the higher education Learning Management System (LMS) market over the past year, as has been described in several blog posts. One of the biggest changes to the market that I’ve noticed is that we seem to be moving from an enterprise LMS market, with full-featured monolithic systems, into a learning platform market, with many cloud-based platforms that don’t attempt to have all the features in one system. the “Beyond the LMS” Common Interest Group. The idea is to not ignore the LMS, but rather to acknowledge that there is so much more going on in the broader academic technology ecosystems and their impact on our campuses, and that much of this activity often includes or is enveloped by the formal LMS. In last year’s WCET-sponsored Managing Online Education survey, 47% of respondents indicated they are reviewing their LMS strategy and 27% are planning to change LMS within 2 years. A key question arises, however, about how institutions should adapt their technology decision-making processes based on these market changes. It’s all well and good for the market to change and provide more choices and new approaches, but how should schools decide which system(s) best fit their specific academic and administrative needs? The emergence of new, often free, cloud-based learning platforms may require changes to our decision-making. I don’t mean to imply that the new LMS solutions should be the answer, but the landscape has changed such that institutions making LMS or learning platform decisions should be aware of the market changes and make a conscious evaluation of which model fits their needs. At Delta Initiative, we have advised a number of schools on their decision processes; however, my point in this blog post is to describe trends that are occurring in the market. The traditional route of institutional decision-making is based on an extended Request For Proposal (RFP) process that typically takes 4 – 12 months. These RFP processes are subtly built on the same assumptions as the traditional enterprise LMS systems – focusing heavily on evaluation of a complete set of features delivered today, often at the expense of understanding the longer-term road maps of the different learning platform providers. If an institution follows a traditional RFP process without adaptations for today’s market, then there are several risks inherent in the approach. The traditional RFP approach will strongly bias the institution to adopt an enterprise LMS solution, whether or not this is the best approach to meet institutional needs. Many of the new providers will not formally participate in a formal RFP, particularly those solutions aiming at faculty adoption over institutional adoption. For example, Coursekit made a conscious decision to not go after the institutional sale. Even if an enterprise LMS solution is best for your institution, by not evaluating the market alternatives there is the risk of organizational resistance to the decision. Laura Gekeler had an interesting post recently about how we tend to overthink LMS evaluations. LMS Evaluations are like any other decision you have to make for your institution. It’s about trusting that the software you choose matches the way your institution does things. It’s a cultural decision. Wasn’t always. But these days the market is mature enough that all these packages (Canvas, Sakai, Blackboard, Desire2Learn, Moodle) can do pretty much the same thing. It’s the way they do them that you care about. It’s the way your institution plans to use and support the software that will make the implementation project a smashing success or an unadopted disaster. While the characterization of a mature market misses the significantly different business models available in the LMS market today, I think that Laura has a great point about how to think about LMS evaluations. The RFP process does have its place, and for public institutions it is often mandatory. What we have found in the past year, however, is that more institutions are beginning to evaluate strategic options before setting up an RFP process, which allows them to understand “the way your institution plans to use and support the software” and to evaluate vendors by “the way they do” their various LMS capabilities. What is becoming more important in successful learning management strategy is understanding that LMS is not a technology alone, but rather a technology infrastructure that goes hand-in-hand with support structures to improve educational practices. 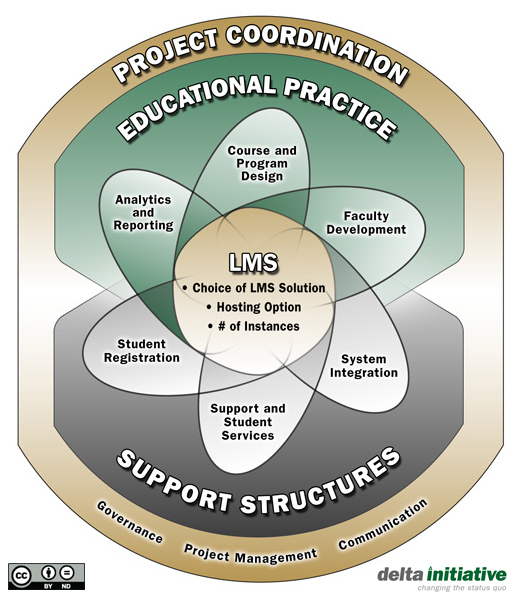 We have found that the following graphic has helped institutions keep the LMS in perspective. In just the past 12 – 24 months, there are some significant new approaches to consider. Faculty adoption – consider OpenClass, NIXTY, CourseSites and Coursekit, which all target (or allow) individual faculty adoption. Free platforms – as above, note that currently all 4 platforms are available fully hosted at no licensing fee as is iTunesU app. iPad platform – this is based on the iTunesU app released in January, which provides a learning platform for the iPad only. Institutional source – MITx is being touted as providing the first fully-automated courses, but less well-known is that their learning platform itself will be available for other institutions to leverage in delivering their own courses outside of the MITx courses and credentialing system. The situation is that there are LMS solutions available with very different road maps, capabilities and business models. Whatever the approach, the most important aspect in my opinion is to base your decision-making process on your institution’s strategic needs. The rapidly-changing LMS market is bringing new technology solutions to consider, but make sure you are solving the right problems. The second most important aspect is to strategically understand the options prior to formally entering an RFP process. How is your institution changing its decision-making process to account for LMS market changes? Let us know in the comments if you’ve taken a significantly different approach in LMS selection and planning. Follow Phil on Twitter, view Phil’s LinkedIn Profile, or view Phil’s blog at Delta Initiative. This post brought to mind an excellent example of an institution that took a strategic and collaborative, committee-based approach to their recent LMS evaluation. UMassOnline thoroughly documented their approach as well as included links to other resources they relied on to shape their evaluation strategy. Fortunately, all their work is documented on a public wiki for anyone else to reference here: https://confluence.umassonline.net/display/LPR/Welcome+-+glad+you+joined+us! This kind of transparency and willingness to share provides the education community with an incredible set of resources to help build an evaluation approach that best meets their needs. Great post, Phil. Wholeheartedly agree with your recommendation to move away from the feature list and focus more on strategic fit. This public site serves as a resource for any institution looking to learn from others who recently went through an LMS evaluation. I invite anyone at an institution with an evaluation on the horizon to explore these decision making artifacts and planning documents shared by other institutions and reach out to those who sat on evaluation committees to explore further. A continued increase in transparency and collaboration around such an important decision making process should serve the community well as the call for evaluation of the LMS and other academic technologies inevitably arises. Great points. I agree with you that an approach viewed simply as IT is very convenient, but misses the need for defining an institution’s strategic needs. As always a great, thoughtful post. As the primary author of one of those thick RFP’s bound to a 4-12 month process, I note that, in the absence of a deliberate, and frankly somewhat cultural introspection about the role of technologies in teaching and learning within the institution, the enterprise approach has a way of becoming the default path. And institutions should be wary of that – if you find, even when required by law, that the easy or obvious solution is to simply go forward with a features-based RFP, you probably haven’t had that serious discussion with stakeholders about the evolving role of the LMS and other personal learning tools in your school. What better indicator of the changing market than the fact that some vendors won’t even respond to an institution-wide RFP! It is also convenient, though flawed, to look at this as simply an IT challenge. When it comes to these tools, an institution’s strategic needs have to be defined far beyond just their IT strategy, and be closely bound to the drivers of the broader academic affairs enterprise. Great post and I really appreciated Ritchie Boyd’s comments. The level of inertia behind the legacy LMS RFP process, let alone alignment with what today defines an LMS seems to challenge the institutions that want to be more nimble and explore new and innovative approaches. I believe it is equally challenging for the companies that do not fit neatly into the legacy LMS box. However, I expect to see as much innovation from institutions on this front as we’ve seen in the market. The “Beyond the LMS” CIG is a great example of industry leadership on this front. One add to your comment on OpenClass. Today OpenClass is available for institutional adoption through the Google Apps Marketplace. We will begin making OpenClass available to non-Google institutions later this spring and for individual instructor adoption later this year.